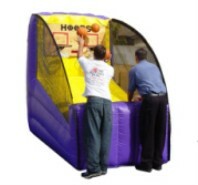 The Worlds first true interactive basketball game! Players must score all of their colored balls on the opponents side within 30 seconds to win. The action heats up when you have to clear your opponents balls, and can't shoot your own. This game is fast, frenzied, and a lot of fun. Timed shootouts for two players at a time. Fast and furious action. See who can sink the most in a two minute period. A HIT with the young kids at Freedom Fest 2008! Try hitting a ball floating on a column of air. It doesn't stay still and makes for a great hand and eye coordination game. Any change of air makes the ball move... so batter up!! Great fun for kids and adults alike. DO YOU REALLY think you can throw a 90mph fast ball? Speed Pitch is a way to find out, throw the ball at the strike zone and have a radar gun clock JUST HOW FAST you threw the ball. Great competition for those that think they can make it to the majors! 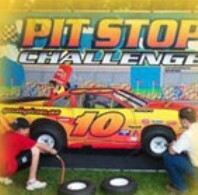 Pit Stop Challenge brings all the energy and excitement of a Stock car race to any party or event. Complete with air impact wrenches, you race to change the wheels like a real pit stop crew. Time yourself and compete against another "Crew"! Great for the NASCAR fans that want to see what it's like to be in the "Pit Crew"
A Great substitute for the Dunk Tank. What a GREAT fund raising attraction this will be. 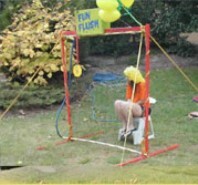 A hose connects to the "toilet tank" and the flushee sits safely behind a net. Throw the ball at the target, and when it hits, the tank flushes it water on the flushee. Put your boss in the seat !! 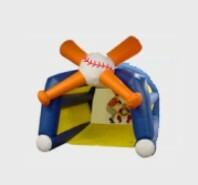 Our Kiddie Striker is a great addition to any carnival event with small children. It is designed for children eight and under. 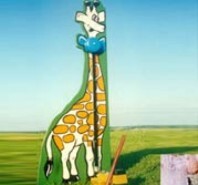 Just like the adult carnival strikers... you strike the base to see if you can ring the bell all the way up the giraffe's neck... only this one is for the kids. Add this game to your inflatable rental. 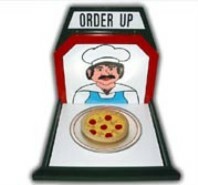 Try your skill at tossing the pizza into the pan. This is a game of skill and is much more difficult than it appears. Another great hand and eye coordination game for smaller children. 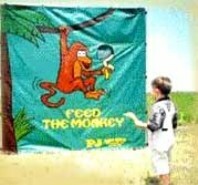 They will giggle as they toss the plastic banana's at the hungry monkey. 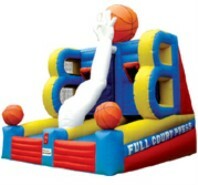 Easy to set up and will keep the kids at your party entertained. 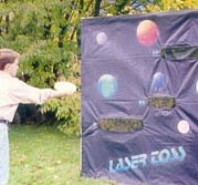 Kids, teens, and adults alike LOVE to play Laser Toss. You try to toss the "flying disks" at the planets to score points. It's great for fairs, teen events, parties, and fund raising events. You could give a small prize for the highest score. Take your pick to check your accuracy. Set the start line closer for the smaller kids. 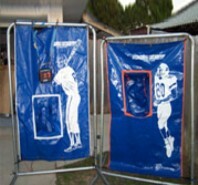 Let them throw either the baseball or football into the "zone" where it will be caught by a net. A great challenge game as well as a hand and eye coordination game. 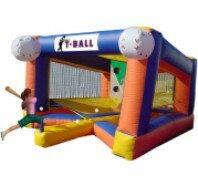 Kick and Score Soccer is a winner at any sporting event fund raiser, or carnival. It is a very simple game, but yet irresistible. Soccer players from the little tykes to the big boys will be lining up to give it a try.